It's not often that we get to post a Jewish flash mob from Johannesburg, South Africa, but so far the Jewish community there is the only one we've seen that takes parts of the Haggadah into the public sphere. 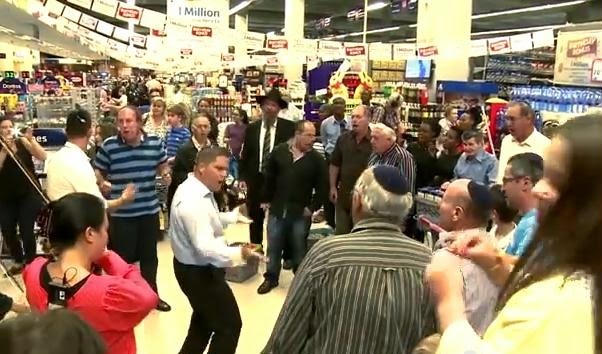 In this case Rabbi Dovid Hazdan of the Great Park Synagogue South Africa arranged a flash mob at Pick 'n Pay, a major supermarket to draw attention to the display of Kosher for Pesach products that are available. The flash mob performed a rendition of Vehi She'amdah, a portion of the Pesach Haggaddah, to the surprise and delight of shoppers.It generated Jewish pride and positive happy energy as it added to the community’s awareness and preparation for Pesach.